Location: Portes, in the Gard departement of France (Languedoc-Roussillon Region). Notes: Château de Portes is located in the municipality of doors, in the Gard department. He watched the old path (or path) of said Regordane, used by pilgrims of Saint-Gilles and the Crusaders to the Holy Land ten leagues. The Anduze, the Randon and Polignac will pay tribute to the abbot of Saint-Pierre-de Sauve to the castle of the eleventh to fourteenth century.Raymond William Budos, nephew of Pope Clement V, buys February 13, 1321 to William de Randon, Lord Luke, the barony of Portes-Bertrand. He expanded the castle and flanked by at least two turns. 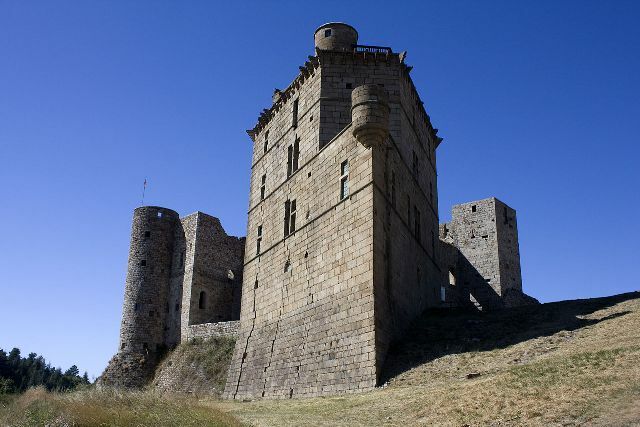 In 1384, Thibaud de Budos recovers the castle taken from his father André, who had sided with the English at the beginning of the Hundred Years War.The lordship becomes increasingly rich and powerful until Louis XIII erected in marquisate in favor of Antoine Hercule Budos. His brother Balthazar is bishop of Agde, one of his sisters, Louise Duchess of Montmorency, another Abbess of the Abbaye aux Dames Caen. Field Marshal, he is killed at the siege of Privas in 1629. His daughter, Marie-Felice, leaves the castle inheritance to his nephew, the Prince de Conti in 1693 that sells his descendant Louis XVI in 1781. The House Doors Budos actually died in the terminal count of Altier who themselves went out indirectly in the counts of Gourcy Chaplain of which still exist. During the Revolution, the property was nationalized and sold six successive owners. It ends up in 1841 in the hands of the family of the Vernède that will restore the monument then in poor condition.Following the intensive exploitation of coal mines under its foundations, land collapse causing the ruin of the castle cracked at its base, evacuated in 1929, and the demolition of the mining village rebuilt 300 meters away. Around 1960, the cavities are filled under the castle, which stabilizes it. In 1969, an association was created to save it from final ruin. It is a historical monument in 1984. The castle is a unique architectural testimony in Europe because of its exceptional spur at 49 degrees, in the shape of a ship's prow, which earned him the nickname "a vessel in the Cevennes".Today the castle is owned by the family Coquebert Neuville.